When suffering from chronic pain, symptoms affect more than just the body. Physical pain also affects mental health, emotional well-being and quality of life. Chronic pain may also cause or increase worry, anxiety, frustration, anger and depression, making the physical pain worse and hampering abilities to cope. In addition, prescription opiates, which are commonly used to treat chronic pain, can pose a challenge for some patients, including hyperalgesia (increased sensitivity to pain) and a risk for addiction. Needless to say, physical, emotional and mental health care are connected, especially for patients with chronic pain. That is why a whole-person, comprehensive approach is the optimal model of care treatment. Yet, despite mounting evidence that integrating behavioral medicine can offset the ongoing cost of chronic pain treatment , the two disciplines tend to operate in silos. New Health Pain Treatment Center has implemented an integrated traditional medicine and behavioral health model that allows patients to experience optimal pain relief and feel empowered to more fully participate in their lives. Patients learn valuable tools and skills to help minimize or avoid opiates while practicing how to successfully navigate the mental and emotional difficulties that almost always accompany physical pain. This is critical now more than ever since as a country we are seeing a high risk for opiate addiction in patients with chronic pain as well as the overuse of opiate medications. In our state alone, more than 22,000 Coloradans report dependence on opioids. Pain treatment – like many other areas of health care – has historically operated in isolation, with different entities providing diagnosis and treatment planning, imaging, physical therapy, surgery and other services. Under traditional models, patients are often referred to different providers for different symptoms, increasing the likelihood of incomplete and fragmented care, delays in care, gaps in communication and less-than optimum outcomes. Almost always missing from the equation is behavioral health. The following approach describes an integrated approach to medical care, designed to improve outcomes and patient experience, while reducing cost. During the initial visit, a medical and behavioral health assessment helps identify the physical, psychological and social factors impacting health. The medical assessment is a comprehensive assessment of the patient’s history of pain, followed by the initiation of therapeutic modalities. The medical history includes a detailed intake of the initial causes of the patient’s pain, the exacerbating factors of the pain over time, any previous medical and surgical interventions that have been offered or administered to the patient and an assessment of which previous modalities of treatment have been most and least successful. In addition, the state’s Prescription Drug Monitoring Program is a valuable tool that can be leveraged to improve prescribing and protect patients who may be at risk of addiction. New Health uses the database to generate a comprehensive, three-year historical report of which pain medications the patient has tried in the past, and this report is reviewed in detail with the patient. A comprehensive physical exam is performed, and patients provide a urine sample for a toxicology screen. The medical team also makes an initial evaluation of the patient’s risk and history of addictive behaviors related to medication use. The behavioral health assessment is an extensive intake regarding all aspects of the patient’s mental health. 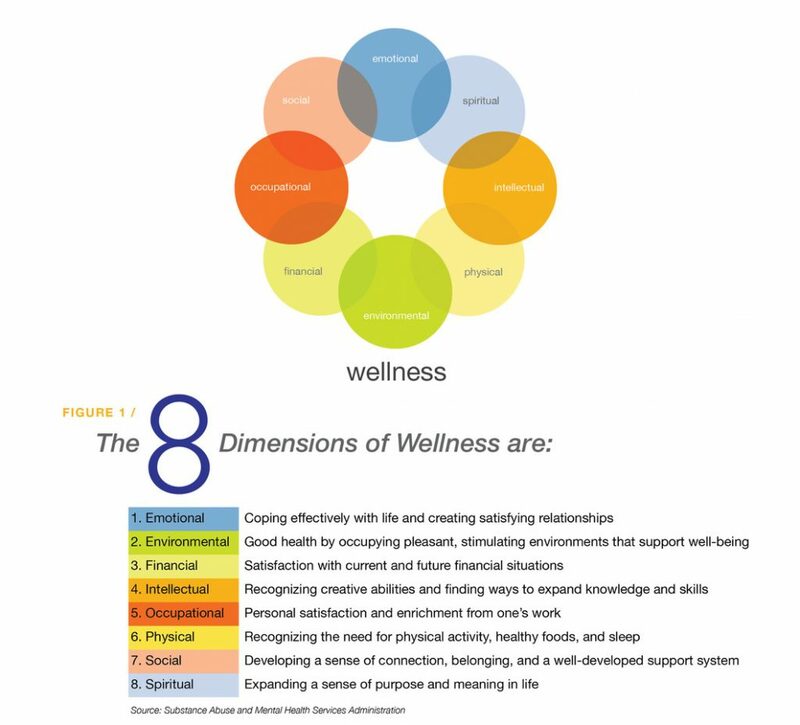 It incorporates elements from the Substance Abuse and Mental Health Services Administration’s Eight Dimensions of Wellness (Figure 1). The medical and behavioral assessments inform the individualized treatment plan that is developed cooperatively by the medical and behavioral health teams. Patients’ individual treatment plans may include a mix of medical interventions, which may include medication management and/or interventional treatment such as nerve blocks, or epidural steroid or joint injections. The medical team can also coordinate referrals for other treatment modalities, such as physical therapy or massage therapy, as needed. The behavioral health team coordinates behavioral health therapies, including individual or group therapy. During therapy sessions, patients receive non-pharmacological coping skills that include: stress reduction, mindfulness techniques, dialectal behavioral therapy skills and other tools for managing pain. DBT skills and techniques may include: mindfulness or focusing skills; distress tolerance, including self-soothing using the five senses through aromatherapy, hot showers and baths, etc. ; opposite action, where a person identifies the feeling he or she is experiencing and takes an opposite action; and emotion regulation (employing deep breathing, etc.). These approaches help improve interpersonal effectiveness and increase patients’ “recovery capital” or healthy life resources. These resources may include social resources, as well as better overall health and well-being, all of which help patients move through pain successfully. Throughout treatment, medical providers should follow up on patient adherence not only to medical treatment but also to the use of coping skills and other techniques to navigate pain. People experiencing chronic pain also often may experience diminished cognitive skills, especially as it pertains to executive functions, which may limit the effectiveness of individual cognitive therapy. Group therapy allows patients to begin working on emotion regulation and distress tolerance, while enjoying the support of other patients with similar struggles. In a group setting, peers offer support while holding each other accountable. Group members are able to empathize and identify with each other’s challenges, which in turn helps eliminate stigma and address feelings of loneliness and isolation. Group therapy also provides an opportunity to practice and refine healthy social and relationship skills before taking them back to their family and community systems. Treating chronic pain is complex, and the risk of addiction must be factored in to individual treatment plans. In 2016, an estimated 3.3 million people aged 12 or older were current misusers of pain relievers, representing 1.2 percent of that population. The initial medical assessment is designed to help identify patients at risk for potential abuse, and responsible drug testing during treatment helps inform clinical decisions by providing valuable information about patients’ use of prescribed medications, non-prescribed medications and illicit substances. Qualified physicians may obtain waivers under the Drug Addiction Treatment Act of 2000 (DATA 2000), meaning they are equipped and trained to identify, as well as treat, those patients identified as having addiction issues. New Health’s physicians have obtained waivers and can prescribe buprenorphine in all its forms, including sublingual and subcutaneous. In some cases, physicians may also arrange for and provide long-acting naltrexone therapy, which blocks opioid receptors in the brain, when indicated. To have a truly integrated approach to pain management, medical and behavioral health providers must be able to share information in real time, working together to adjust patient treatment plans to reflect patients’ progress and needs. 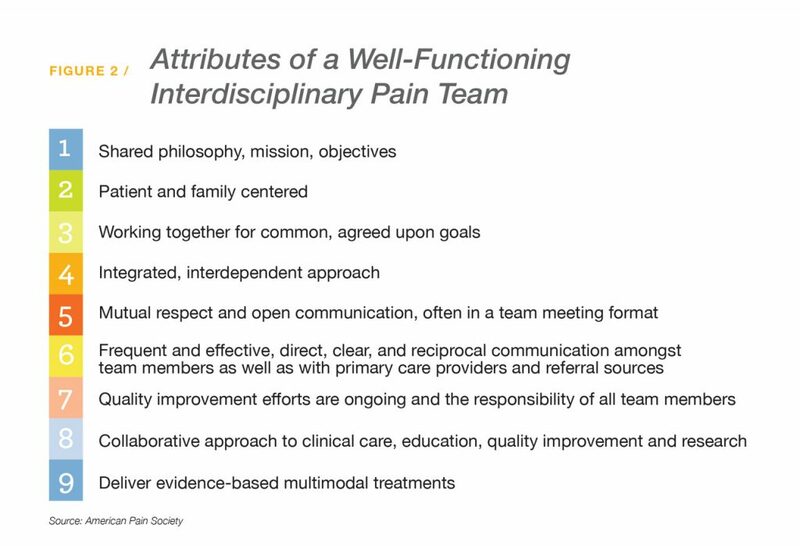 The American Pain Society has developed a list of desirable attributes of interdisciplinary teams (Figure 2). An integrated care model helps patients become physically, mentally and emotionally stronger so they can live happier, healthier lives. It is imperative patients receive tools and skills to help minimize or avoid opiates while learning how to successfully navigate the mental and emotional difficulties that almost always accompany physical pain. This is critical now more than ever since as a country we are seeing a high risk for addiction in patients with chronic pain as well as the overuse of opiate medications. New Health provides an innovative way to help chronic pain patients become physically, mentally and emotionally stronger so they can live happier, healthier lives. Our doctors and therapists work together to formulate a treatment plan and make sure each patient’s individual physical and mental wellness needs are met. Our unique model helps minimize or avoid opiates while giving patients the tools they need to feel better and to navigate the mental and emotional difficulties that almost always accompany physical pain. Dr. Nathan Moore, medical director of New Health, is board-certified in family and addiction medicine. He previously served as president and chief executive officer of MedNow Clinics and ARCH Detox. In that role, he oversaw the development of effective outpatient detoxification programs/protocols for opiates, alcohol and benzodiazepine use disorders. A graduate of the Duke University School of Medicine, Dr. Moore serves on the board of Practice Health and Colorado Care Providers and chairs the finance committees of both organizations. Osvaldo Cabral has worked in addiction and mental health since 2002 and specializes in addiction treatment, dialectical behavior therapy, skills training, aggression replacement training, cognitive behavioral therapy and trauma-focused therapies. As director of integrated services, he coordinates the operations of New Health’s medical and behavioral health professionals to ensure continuity of care for New Health patients. For more information, please contact Natalie Lamberton, vice president of business development, at 303.668.2177 or nlamberton@newhealthservices.com. Chiles, JA, MJ Lambert and AL Hatch. The Impact of Psychological Interventions on Medical Cost Offset: A Meta‐analytic Review, Clinical Psychology: Science and Practice, 6, 2, (204-220), (2006). T Manocchio. The ABCs of MAT (Medication-Assisted Treatment), Colorado Health Institute, May 31, 2017. Accessed Aug. 2018 at www.coloradohealthinstitute.org/blog/Abcs-mat-medication-assisted-treatment. Center for Substance Abuse Treatment. Substance Abuse Treatment: Group Therapy: 6 Group Leadership, Concepts, and Techniques. Substance Abuse and Mental Health Services Administration (US), TIP Series, No. 41, Rockville, MD (2005). Substance Abuse and Mental Health Services Administration. Key substance use and mental health indicators in the United States: Results from the 2016 National Survey on Drug Use and Health. Substance Abuse and Mental Health Services Administration, HHS Publication No. SMA 17-5044, NSDUH Series H-52, Rockville, MD (2017).